Head is the most important part of the body since it houses the most important organ of the body, the brain, which is enclosed in a hard protective covering called the skull. Trauma to the skull can be very serious if undetected and not treated properly. An injury to the skull can lead to a possible skull fracture, which will require immediate medical attention from a doctor. Your skull is made of 22 cranial bones (skull bones) and 14 facial skeletal bones. The Cranium is the part of the skull which protects your brain and the brain stem. The bones in the skull fuse at the edges by sutures, to form a firm but slightly flexible structure. In the event of getting hit by a hard blunt force on the head, the bones in your skull may be broken to a varied degree of severity. 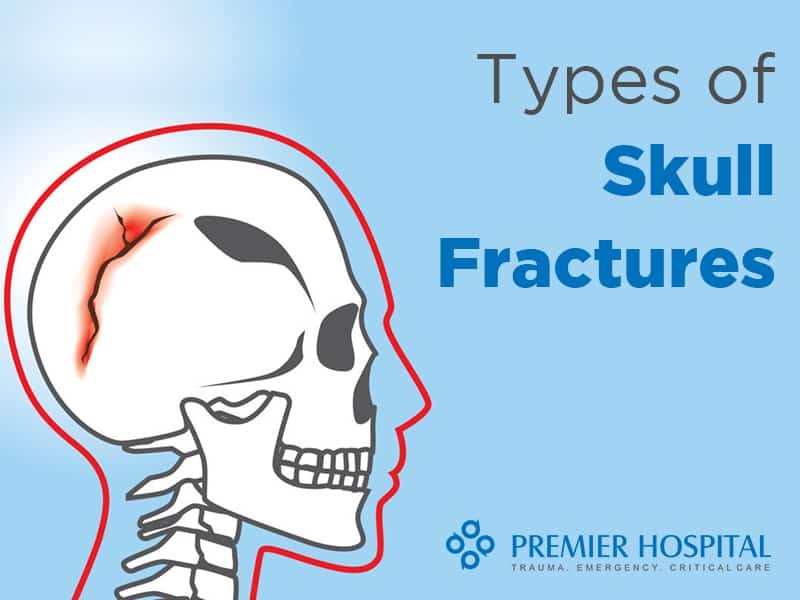 Depending on the degree of injury the skull fractures are categorized into 4 types. Linear fracture: This is the most common type of skull fracture. The broken bone is immovable, hence no special treatment is required. It appears as a thin line on the bone, which heals by itself. The patient is admitted for observation and is discharged within 2-3 days. The patient can get back to his/her daily routine in a few days. Pain management is done by prescribing “over the counter” pain medicines. Depressed fracture: In this type of fracture, the skull bone is depressed such that a dent is visible at the site of the fracture, with tenderness (pain on touching the area). The skull appears to be sunken and may protrude into the brain cavity. Immediate medical intervention is required. This type of skull fracture can be open (with a cut in the scalp) or closed (without a cut in the scalp). Surgery is required depending on the severity of depression. Diastatic Skull Fracture: This type of skull fracture is mostly seen in infants, in whom the sutures have not fused completely. The sutures are the fusion points of the skull bones, which form when we are kids and completely fuse as we grow up into adults. The sutures are broken or fall apart in this type of fracture, leaving 2-3 pieces of broken bones. Diastatic fractures can be open or closed. Open fractures, where the skin is cut and the bones are protruding require immediate medical attention and surgery. Basilar fracture: This type of fracture occurs at the base of the skull with bruises around the eyes and ears. It is considered the most severe type of skull fracture. The cerebrospinal fluid surrounding the dura mater in the brain may leak out due to a crack in the brain cavity. There may be a clear discharge of Cerebrospinal fluid (CSF) from nose and ears. Patients with this type of fracture have to be kept under close observation in the critical unit. Surgery may be required to stop the leakage of CSF. Additionally, the skull fractures can be open or closed fractures. 1. Closed fracture: The fracture is a closed one if the fracture is not seen with the naked eye. The skin at the site of the fractures is not cut or open. 2. Open fracture or Compound Fracture: This is the fracture in which the skin is cut open and the skull bone is seen with the naked eye. Sometimes the broken skull bone protrudes out of the skin. Car accidents when the driver is speeding the car. Falling from a great height to the ground. Being hit on the head with a hard blow. How can I avoid skull fractures? The risk of skull fractures can be avoided by wearing protective headgear or helmet while driving or playing extreme sports, which pose a threat of trauma to the head. Sometimes the skull fracture has no apparent symptoms. But in the ones that do have symptoms, it depends on the intensity of injury. Mild fracture such as a linear fracture has no symptoms except intense pain. Bleeding from the site of fracture is seen in an open fracture. Severe pain and tenderness are seen at the site of a depressed fracture. A sunken skull is also observed. Basal fracture is accompanied by racoon eyes (bruising around the eyes) and behind the ears. The treatment of the skull fracture depends on the severity of the damage to the skull bone. Mostly skull fractures heal on their own, so the doctor may prescribe some pain medication and rest to manage the pain and allow healing. Depressed fracture: If the extent of depression is deep, in which case it may enter the brain cavity or have cosmetic implications, surgery will be needed to correct the depression. A compound or open fracture: Immediate treatment is needed if the skin on the scalp is cut and the skull bone protrudes out. This is considered an emergency. Call Your Doctor immediately in the event of a skull fracture to get diagnosed and treated as soon as possible. In case of emergency of the skull fracture, do not wait, rush to the hospital. We at Premier hospital, have highly Qualified Surgeons who are experienced in handling trauma with urgency and utmost care. Our Emergency Services are available 24/7 to handle any kind of trauma, related to injury to the head and skull fractures. Dr Chandrashekar Reddy is a Senior Consultant in Neurosurgery at Premier Hospitals, who has plenty of experience with many years of clinical and teaching practices at various medical colleges within Andhra Pradesh. He completed his MS in Mysore University and Mch NeuroSurgery at Gandhi Hospital.